Bright poppy red is one of my favorite colors and in the warmer months I wear it as much as possible. And if I'm being completely honest, I can also be found wearing it on my nails throughout the winter. 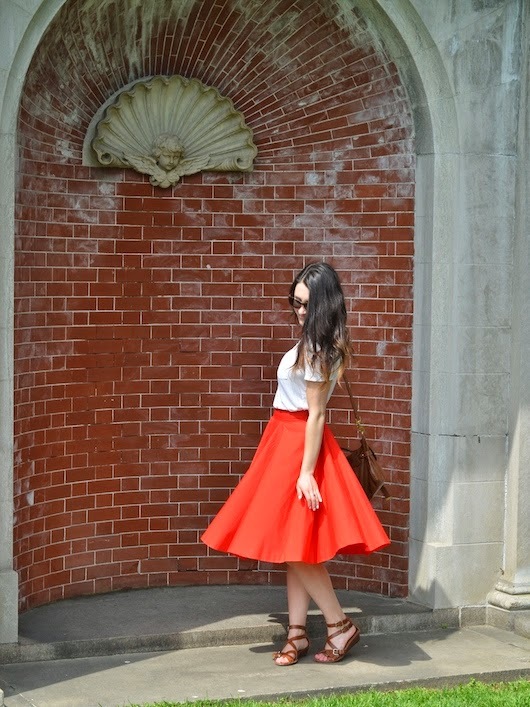 I had been on the lookout for a full, mid length, poppy colored skirt since last summer. I love this style. It's the kind of shape that may go out of style for a few years here or there, but you can look back on in fifty without cringing. I wore this outfit last weekend on our visit to the Old Westbury Gardens. Since it was such a humid day, I decided to dress the skirt down a bit by pairing it with a simple white tee and strappy sandals, something I immediately regretted once I saw the photos. They don't really do much for my legs with a skirt this length. Ah, you live and you learn. Next time.